LACKLAND AIR FORCE BASE, TX -- Army Col. David Rolfe's military career has gone to the dogs. As director of the Defense Department's Military Working Dog Program based here, Rolfe and his staff are responsible for the health and welfare of some of the most unheralded members of the fighting force: its estimated 2,300 working dogs. These dogs, along with their handlers from every military service, are deployed worldwide to support the war on terror, helping to safeguard military bases and activities and to detect bombs and other explosives before they inflict harm. With an acute sense of smell five to 10 times stronger than a human's, working dogs can detect minute traces of explosives or drugs and alert their handlers of their presence, Rolfe explained. But at the same time, dogs have ability to inflict fear in an aggressor in a way a human — even if armed — often can't, and will defend their handlers to the end. "People see a dog and don't want to mess with it," said Staff Sgt. Andrew Mier, a military working dog trainer who has deployed to Southwest Asia three times as a handler — twice to Saudi Arabia and once to Qatar. "A dog creates a strong psychological deterrent." The vast majority of U.S. military working dogs are German and Dutch shepherds, and Belgian Malinois breeds Rolfe said are "very aggressive, very smart, very loyal and very athletic." "We expect so much of them that we need them to be strong and athletic," he said. "We want a high-strung dog with aggressive tendencies because that's what the mission demands." Dogs have long been recognized as "force multipliers" by military fighting forces around the world, Rolfe said. The Romans put razor-sharp collars around their dogs, then sent them into the enemy's ranks to bite and cut their foes. The U.S. military has used working dogs since the Revolutionary War, initially as pack animals, and later, for more advanced uses, such as killing rats in the trenches during World War I, he said. But World War II witnessed the biggest surge in use of working dogs to support military operations. The U.S. military deployed more than 10,000 specially trained canines, most as sentries, but others as scouts, messengers and mine detectors, Rolfe explained. Today, "a couple hundred" working dogs are serving with U.S. forces in Iraq and Afghanistan as patrol dogs and explosives and drug detectors, Rolfe said, adding that contractors use additional dogs in the theater. Nearly 2,000 more working dogs provide similar services at U.S. bases and operating posts around the world. Meanwhile, the military is increasing its reliance on working dogs. Before Sept. 11, 2001, Rolfe said Air Force security forces trained about 200 working dogs a year for the Defense Department. That number is up to more than 500, with the vast majority of dogs being trained as sentries and bomb-sniffers. The 120-day program teaches the dogs basic obedience as well as more advanced skills, such as how to attack and how to sniff for specific substances. 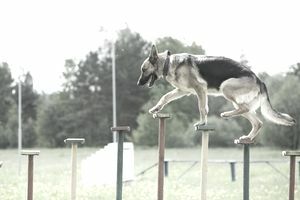 Rolfe said the initial training program, conducted by the 341st Training Squadron team, is based on "positive rewards" -- generally a ball or rubber toy rather than food. "We learned long ago that food works only so long. What the dog really wants you to do is play with it." Once the dogs receive their initial training, members of the 37th Security Forces teach the dogs and their trainers to work as a team. "One of the biggest challenges is getting a handler to recognize what a dog is showing him," said Air Force Staff Sgt. Sean Luloffs, an instructor at the school. "But the big gratification is watching the teams improve and be able to perform at a higher level, and knowing that you had a part in it," added Mier. While the Air Force trains military working dogs and their handlers, Army veterinarians posted around the world help keep them fit for duty and treat their ailments. Telemedicine, so popular in the civilian health realm, is being used to provide expert consultation for military working dogs. "We want them to stay in the field and be treated in the theater," said Army Maj. Kelly Mann, chief of radiology for the Military Working Dog Program at Lackland Air Force Base facility. In addition, Rolfe and his staff operate a fully equipped veterinary hospital at Lackland. As working dogs become increasingly important to the military mission, work is underway to help protect them from enemy threats. Rolfe oversees a research and development program that's looking at improved body armor and gas masks for military working dogs. No good method exists to protect a dog from a nuclear, biological or chemical attack, he said. "But it's definitely something being looked at," he added. Meanwhile, the Walter Reed Institute of Research is studying the use of pills that can help military working dogs survive a nerve-agent attack. Research is also underway to create an "artificial nose" capable of duplicating a dog's — but Rolfe predicts it's a long way down the road. "Some people say it could be 50 years before we'll have an artificial nose that can replace a dog," he said. Besides, dogs possess something Rolfe said a machine probably never will: immense loyalty and a desire to please. "A machine doesn't care if it finds something," Rolfe said. "But a dog wants to please its handler. A dog will go looking for something on its own where a machine won't." The bottom line, he said, is that "dogs have a heart — something that makes them an invaluable asset to our fighting forces."